When making a professional presentation or proposal, all you need are Wilson Jones Insertable Tab Indexes to give you the finishing touch. These tabbed single sided insertable tab indexes make giving your presentation the perfect professional look easy as well as giving lasting durability so you don't have to worry about traveling around. Available in a classic professional 32lb. buff with durable binding edges and reinforced tabs, these sheets can even be formatted and printed on with laser or inkjet printers for full customization. Check them out today. Nice price for the number of sheets, however thinner divider paper than usual. Great for yearly updates for kids binders. Planned for 1 year of used before replacing with new ones. For longer term, buy something a little more substantial. I homeschool my daughter and it looks like we never have enough of these dividers. I saw this set and was concerned they might be poor quality - but they are just as good (if not better) than the ones we purchased at an office supply store for a far greater price, on sale! I'm glad I stocked up! Welcome to MyBinding.com. 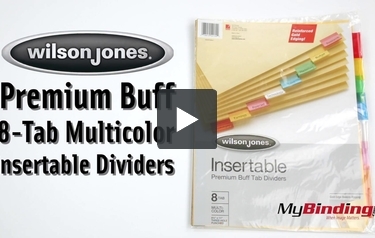 These are the Premium Buff 8-Tab Multicolor Insertable Dividers from Wilson Jones. Premium Buff dividers stand up to the test. Heavy duty buff paper, double sided gold reinforced 3-hole binding edges and long lasting colorful tabs make for some of the highest quality dividers on the market. White perforated inserts can be written out for your tabs, or use your own printer to make very clear labels. This set of 8 color coordinated dividers works great other organization systems. For more videos and all your binding needs, go to MyBinding.com.